Ford Says Despite Trump's Tweet, Focus Active Won't Be Produced In U.S. The automaker canceled plans to produce a small car in China and sell it in the U.S., citing the cost of tariffs on imports from China. Trump had suggested the cars could be made in the U.S. instead. 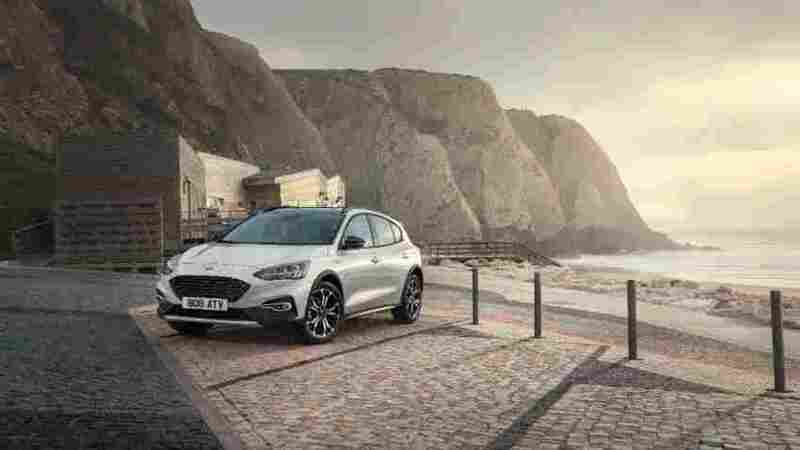 The Ford Focus Active, a small crossover car currently sold in Europe, was slated to begin production in China for the U.S. market. Ford canceled those plans, citing tariffs imposed by the Trump administration. Ford, however, has no plans to move production to the United States. "As we said last month, it would not be profitable to build the Focus Active in the U.S. given an expected annual sales volume of fewer than 50,000 units and its competitive segment," the company said in a statement emailed to NPR. The automaker emphasized that it already has a substantial manufacturing presence in the U.S.
"Ford is proud to employ more U.S. hourly workers and build more vehicles in the U.S. than any other automaker," the company said. "In addition, Ford is growing its U.S. vehicle lineup — including introducing all-new trucks, utilities, hybrids and fully electric vehicles — and is committed to returning operating margins to 10 percent in North America." The Ford Focus Active has never been sold in the U.S., and Ford does not currently import any vehicles from China. But Ford had originally planned to bring the small crossover vehicle to the U.S. market beginning in late 2019. Writing this spring, Car and Driver described the Focus Active as "a four-door Focus hatchback with a 1.2-inch suspension lift, black plastic around the wheel arches, faux skid plates at front and rear, and a slightly different front bumper and grille design." Ford has traditionally produced a range of sedans, including the Focus, Taurus and Fiesta. Earlier this year, however, the company announced a major shift in focus (no pun intended): It would begin phasing out virtually all of its cars in the U.S., while doubling down on trucks and SUVs. "Here in the U.S., Ford has really been a truck company," as NPR reported in April. "And according to the best estimates, Ford makes over 90 percent of its profits on its F-Series trucks. That's mostly the F-150." By phasing out less-profitable sedans, Ford will be freeing up money to invest in electrifying its SUV lineup. Under this new vision for the Ford lineup, only two passenger cars would be sold in the U.S.: the Mustang, an instantly recognizable sports car and symbol, and the China-made Focus Active. With the cancelation of the Focus Active, a Ford spokesman confirms, the Mustang will eventually be the only Ford car model sold in the U.S. Meanwhile, General Motors is seeking an exemption from the same tariffs on vehicles that hit Ford, suggesting that it will have to pull the China-made Envision SUV off the market if the exemption is not granted. Even cars that are both made and sold in the U.S. are not exempt from the implications of tariffs. The industry group Motor & Equipment Manufacturers Association has expressed concern over tariffs on raw metal, saying they have a destabilizing effect on U.S. manufacturing and that the process of asking for exemptions is "opaque, inconsistent and inaccessible." The Trump administration's decision to impose tariffs on China triggered swift retaliation, setting off a back and forth that has been escalating for months. The trade war has hurt U.S. agriculture, prompting the administration to offer compensation to affected farmers, and promises to pinch a variety of American businesses — including companies that are based in the U.S. but do some production in China, such as Ford was planning to do. Meanwhile, Trump has also imposed tariffs on imports from Canada, Mexico and the EU, prompting more retaliatory tariffs. The EU trade spat prompted motorcycle manufacturer Harley-Davidson to announce it would move some U.S. production overseas, to allow it to continue to sell to European customers without feeling the bite of the EU's counter-tariffs.